kitchen sink. This little violet has been with me for many years now. Mom. And finally her death last year. When I first bought this violet, it was tiny but full of blooms. hardy and vibrant and full of blooms as this one had once been. the plants were hydrated each evening. rays of the strong Texas sun. Both prospered. Both bloomed. to one side and it's blooms were shriveling and falling off. new little leaves growing at the top. This violet is a metaphor of my life. It's been a rocky road. my spine and grow in a new direction. I am starting over ~ yet again. Cheers to you and the violet bursting into bloom once again! Great metaphor! My violets do that. I don't think I understand their needs. Or have the proper exposure for them. Your beautiful violet reminded me of how much my mom loved these and they grew for her and bloomed ....when she would give me one, we both started counting the days until it died...bwaaaa....now I am missing my mama. Aw...how sweet, Susan. Your violet is very pretty and like everyone else is saying, a beautiful metaphor to life. My Daddy passed away in 1998 and I kept two ordinary little ivies that were given at his funeral and brought them home. They survived until last year when we decided to move to upstate. The plants were getting leggy so I let them die, I know sounds mean. Then a couple of months ago I bought another little ivy in memory of both my parents and now I'll start over. 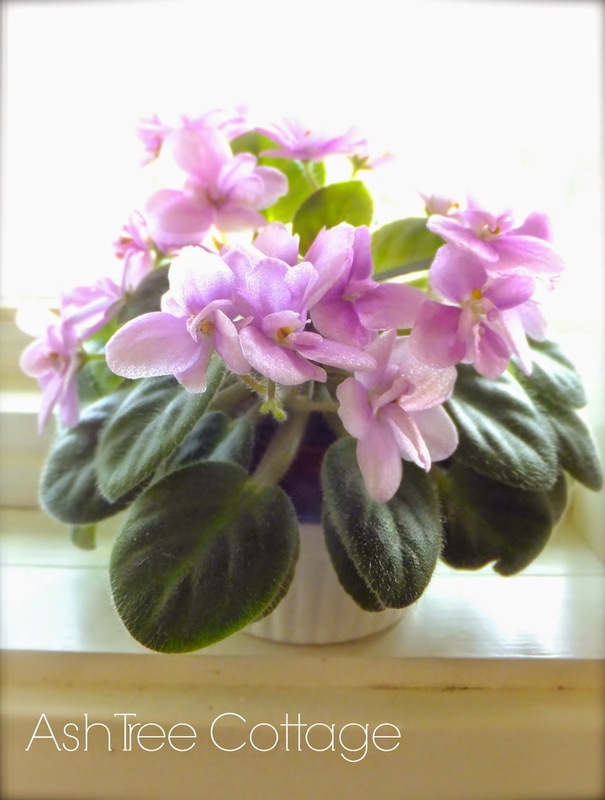 I can remember using African violets in Vacation Bible School when I was little. Susan, this is a beautiful metaphor. Change and challenges make us stronger, no question. You will flourish just like your little plant. Take care! As Sarah says, this is a beautiful metaphor. 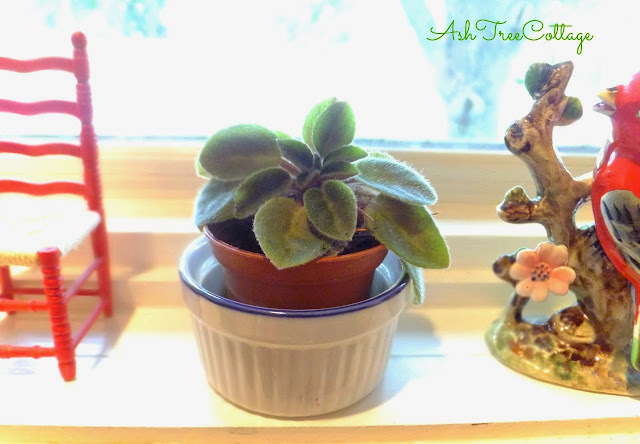 It takes care and tenderness to keep an African Violet blooming year after year, and sometimes it takes harsh measures. Life's like that too. We don't always find ourselves in the most comfortable place and sometimes we have to be gentle with ourselves and give ourselves just a little something extra......and then there are times when we have to give ourselves a talking-to or even experience an upheaval in order to thrive. You thrive!! I am reminded of the old saying "she's like a shrinking violet". ( I think that is the correct version?!?!.) Sometimes we just want to shrink from our own skin and disappear. But God and life won't let us. You have so much life to live. Give yourself permission now, after all the turmoil of the past, to start living your life to the fullest. Life is short. Spend the rest of it for YOU. I wish you HAPPINESS. I know exactly what you mean, and you described it perfectly. In the midst of the ups and downs of life and life not looking like I thought it would,all I know to do is the next right thing. I have memories of my grandmother, who in the South Texas heat would work in her garden or 'tend' whatever needed tending. I always thought she was just working hard- but now as an adult woman, I wonder if she was grieving? This post is an inspiration to all of us . 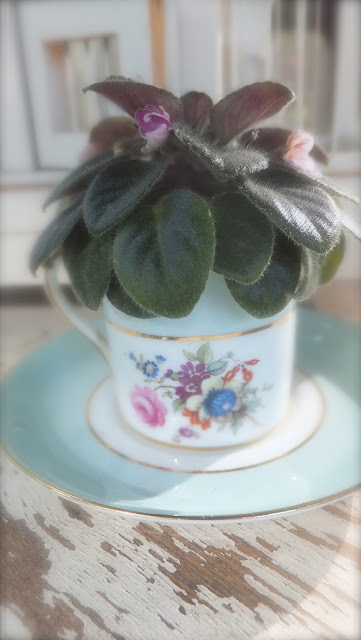 Oh, Susan I love how you tied the stories of your African violets to your own life story. So fitting. Thank God for new beginnings, yes? I've had many beginnings and endings, and I imagine I will have many more, Lord willing. Here's to your fresh start! May it bring great happiness to you!